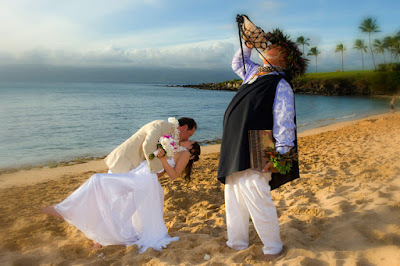 Gloria and Jim stepped it up with a few extra amenities for their Maui wedding. Our Harpist, Kristine, was on hand to provide a melodic backdrop of sweet classical music (she can also play Stairway to Heaven on that thing), while Laki performed another Hawaiian wedding ceremony as only he can. We had a gorgeous afternoon at the beach with Maui Wedding Photographer Joe D'Alessandro providing uncompromising imagery.